This was a great idea for an exhibition: Impressionist paintings connected with the dealer Paul Durand-Ruel, who was so important in promoting the work of Monet, Renoir, Manet, Degas, Pissarro and Sisley. Everything here was either sold by him, owned by him or in one of the influential exhibitions that he organised in Paris, London or New York. I’d had no idea quite how influential he was in the lives of these artists. To give just one example: he transformed the fortunes of Manet. After seeing two pictures at the house of an artist friend of Manet’s, he visited Manet’s studio and bought twenty-one paintings for a fabulous sum. Up until that point he had hardly sold anything. 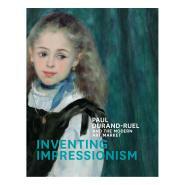 Durand-Ruel’s support of the Impressionists was far from being just a commercial proposition. He loved their work, had his and his family’s portraits painted by Renoir, and kept some of their paintings to the end of his life. The exhibition is fascinating, but it’s also pure visual pleasure. I went on Wednesday and it was the ideal day to see it. I came out into a day of blue skies and trees coming into leaf. Perfect Impressionist weather. I saw this one too, really enjoyed it. Such beautiful pictures, and I thought just the right size for an exhibiton – 85 paintings is just right, not too big, not too small. Yes, perfect, wasn’t it. I much prefer this size to a blockbuster exhibition.